If you need a lot of room and a lot of towing power all wrapped up in a package designed to pamper not just the driver but also every passenger onboard, look into the QX56. The QX56 is big - really big - and that has its benefits and disadvantages. Its exterior also clearly reveals its Nissan Armada origins, which may render it too commonplace for some buyers seeking the luxury Sport Utility Vehicle experience. A slight bump in horsepower from 315 to 320 marks the only change for 2007. The QX56 touts a massive interior with three rows of seating and an abundance of headroom. Heated leather captain's chair seating in both the first and second rows is tastefully executed, as is the use of orange gauge lighting and real Blond Apaya wood on the dash, console and steering wheel. Though thorough in its execution, the QX56's interior is not as polished as it could be. Some of the plastic trim pieces just don't seem to fit in with the rest of the interior. Vehicles such as the Lincoln Navigator and Land Rover Range Rover have raised the bar for luxury SUV interiors, and the QX56 needs to rise with it. The QX56's enormous chrome grille and the huge 18-inch wheels should go over well with the hip-hop crowd. Bright xenon headlamps are standard, as are chrome mirrors with built-in puddle lights. Both the taillights and high-mounted center brake light employ LED lighting. We know many will not care (or remember), but in profile the QX56 reminds us of an oversized 1961 AMC Rambler Cross Country Wagon. On the road the big Infiniti is surprisingly agile and easy to maneuver. The V8 provides plenty of pickup, with instantaneous response from the drive-by-wire throttle and a nice throaty growl from the specially-tuned exhaust. The ride remains smooth at all times, and our fully-loaded test vehicle had Vehicle Dynamic Control (VDC), the benefits of which can be appreciated on sharp curves. The QX56's steering feel is heavy yet direct and, although the long front hood might seem to make maneuvers difficult, having the front wheels pushed to the outermost edge of the vehicle allowed us to accurately "dock" the QX, even in the tightest parking spaces. The QX56 offers only a few options to make its Manufacturer's Suggested Retail Price (MSRP) of $50,750 extremely attractive. Toss in four-wheel drive, a rear-seat entertainment system, power sunroof and Intelligent Cruise Control and the price tops out around $58,000. 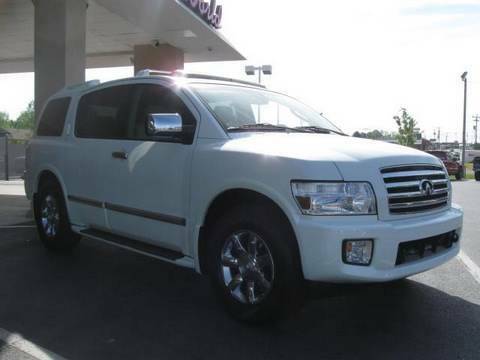 According to the Fair Purchase Price, buyers of a loaded 2006 QX56, such as the one described above, paid just over $50,000, or about $2,100 below the MSRP. To see what buyers are currently paying, check the Fair Purchase Price located just below the vehicle's invoice price. As for resale value, you won't lose any sleep worrying about the QX56. With better-than-average projected residual values at 24-, 36-, 48- and 60-month intervals, the QX56 holds its value better than the Cadillac Escalade ESV and Lincoln Navigator, but falls behind the Lexus LX 470 and Mercedes-Benz GL450. The QX56 comes with a five-speed automatic transmission with manual shift mode, dual-zone automatic air conditioning with front and rear controls, limited-slip rear differential, four-wheel anti-lock disc brakes (ABS), removable second-row storage console, xenon headlamps, keyless illuminated entry, fog lights, automatic headlamp control, power rear liftgate, dual heated power mirrors with memory, power rear vent windows, auto-dimming rearview mirror, navigation, RearView Monitor, power adjustable pedals, heated leather seats, 10-way power driver's seat, eight-way power passenger seat, traction control, tire pressure monitor, cruise control, Vehicle Dynamic Control and a rear wiper/washer. The standard audio is a 265-watt Bose system with 10 speakers, a subwoofer and an MP3-compatible six-disc CD changer. Options include full-time four-wheel drive, DVD entertainment system, power sunroof, SIRIUS or XM Satellite Radio, Intelligent Cruise Control and a split folding center-row seat (a no-charge replacement for the captain's chair seating). Fold-flat captain's chair seating makes it easy to go from crew cabin to cargo hauler. The optional rear DVD entertainment system makes passengers feel like they are flying in first class. Though the QX56 offers only one powerplant, it's pretty impressive. The big Infiniti V8 has huge torque reserves and never feels strained, even when the vehicle is fully loaded. Infiniti's mammoth QX56 plays in the same league as the Cadillac Escalade ESV and Lincoln Navigator L. You won't find anything of this size from Lexus, BMW, Mercedes-Benz or even Land Rover, making the QX56 the only real import alternative to the large domestic luxury choices. Based on the Nissan Armada, the QX56 is given enough chrome, leather, wood and power accoutrements to satisfy the most demanding luxury SUV buyer. Beyond its luxury features the QX56 actually has a utilitarian side, offering seating for eight, a 320-horsepower V8 engine and a tow rating of 9,000 pounds (8,900 on the four-wheel-drive model). Love the vehicle style. Had some electrical issues at first with lift gate. But it has been a great car. Very roomy and rides great. Very reliable vehicle for families and has nice features. The features feel like a luxury vehicle. Everyone compliments the car and enjoys it. Still awesome after 10 years! After 10 years, 125k miles, still totally comfy. No major mech issues. White with light tan interior leather. Still handles great. Captains seats in 2nd row. Seats 4 adults very comfortably. Rear seating area can not accommodate adults, but several kids fit fine. The car will take off completely if you are not careful. That is why there are cameras to help you when you are reversing, so when you zoom out of the driveway, there are no blind spots. I love the spacious interior and navigation system. I appreciate the detail built into the car such as the far rear windows being able to open, a DVD player, and vents in each of the 3 sections. You're even able to control separate vents from the backseat.